If I slapped you in the face, poked you in the eyes, and then said something like, 'Nyuk-Nyuk-Nyuk, what would you think in turn? Would it be: (A) This idiot's mad! (B) I wonder what aftershave he's got on? (C) Well, at least he never said anything rude! Or (D) Hey, let's go to a museum! 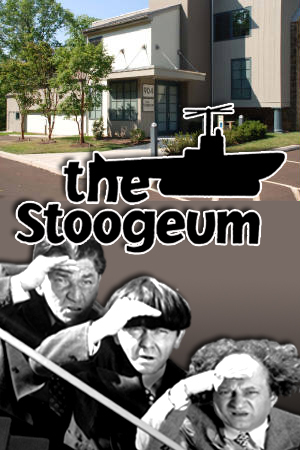 Most notably, The Three Stooges Museum, otherwise known as The Stoogeum. Want to know more? Then please check out the following interview I did with one of their Archivists: Erin Smith. 1) Please tell us a little bit about yourself, Erin, including your involvement with The Three Stooges museum. My name is Erin Smith and I am the Archivist at The Stoogeum. I have a Masters Degree in Library and Information Science, specializing in Archives and Preservation, and at The Stoogeum, I manage our document collections, including designing and overseeing digitization projects. In addition to this, I also manage our museum’s gift shop and compile Stooge family trees. 2) What were the circumstances that led up to the formation of this museum? The museum and its collection are owned by one man, Gary Lassin. While he always had a collector’s spirit, Gary began collecting Stooge memorabilia nearly 40 years ago when he first met his wife, Mrs. Lassin, otherwise known as Larry Fine’s grandniece, and he enjoys being able to preserve her family’s legacy. The collection has grown throughout the years and the current building was opened in 2004. The Stoogeum occupy's three floors, totaling over 10,000 square feet, with over 10,000 items on display. We also have three on-site storage facilities, an archive and research library, a film vault, and an 85-seat theater. 3) What is your favorite Three Stooges film? Well, it changes from time to time, but right now I am very into “Gents Without Cents”. It was released in 1944 and is a World War Two themed film about The Stooges being out-of-work performers looking for a gig. They hook up with a trio of ladies who are acrobatic dancers (played by Lindsay, Laverne, and Betty, a real-life performing group), and it includes the famous “Niagara Falls” routine. Overall the film is hilarious and the girls are just delightful. In fact, Betty is still living and is a great friend to the museum. 4) Can you tell us about some of the items you have on display? Having over 10,000 items on display means we have a little bit of everything. We have hundreds of posters and lobby cards that advertised the shorts back in the 1930s and 40s. We have a room dedicated to posters from foreign countries. We have an entire wall of autographed photos from the various actors and actresses that worked with The Stooges. We have toys and memorabilia that was licensed by The Stooges, ranging from the 1940s to modern day. We also have personal items that belonged to each member of the group, such as Moe’s watch and Shemp’s wallet chain. 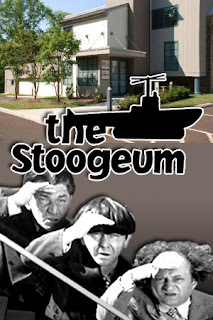 One of the custom pieces created for the museum is a set of three wax-coated bronze statues that are life-like recreations of Moe, Larry, and Curly, and for the younger Stooge fans, we also have three different playable arcade games, including a one-of-a-kind pinball machine. 5) What is your favorite piece and why? On our bottom floor, we have three very brightly patterned coats. These coats were worn by Moe, Larry, and Curly Joe DeRita in the 1960s to their various live appearances. We received them from DeRita’s estate, and, in Moe’s coat’s interior pocket, you can still find the comb he used to comb his hair forward when it was time to perform. It is such a fun and unique detail that you’d only discover by talking to a staff member. 6) Do you commemorate any of the anniversaries associated with The Three Stooges, and if so, how? We are very active on Facebook and post a piece every week, often focused on “This Day in Stooge History.” We try to be very diplomatic, and not promote certain films or Stooges over any other. All of it is important and we like to let people know about some of the less-known details about The Stooges and their careers. Now for any more information about the Stoogeum please check out their website and facebook page. The museum is open to the public between 10am and 3pm every Thursday (except holidays), with no reservations required, except for Monday, Tuesday, Wednesday, and Friday, where an appointment must be scheduled beforehand.